MultitrackStudio includes a disk-streaming sampler. Samples can be played direct from disk, so patches can be larger than the amount of RAM memory available. Using the Load Patch button you can load a patch. Sampler patches are files with .PTC extension. Other formats (.SF2, .GIG or .SFZ files) can be selected as well, doing this will invoke the built-in patch converter. See also Organizing your patches. The Edit Patch button invokes the Patch Editor. The Polyphony setting can be used to limit the number of sampler that can be played simultaneously in order to reduce CPU or disk usage. For example: the number of playing samples can become quite large while playing piano if the sustain pedal is kept down for a long time. Reducing polyphony can help in this situation. The controls in the Controls section override the values stored in the patch (as set by the Patch Editor). Tip: simple patches, containing just one sample, can be created easily by dragging an audio file from File Explorer (Windows) / Finder (Mac) to a MIDI track's Instrument Slot. You can also drag the selected part of a track editor or clips from the Clip Shelf to an Instrument Slot. 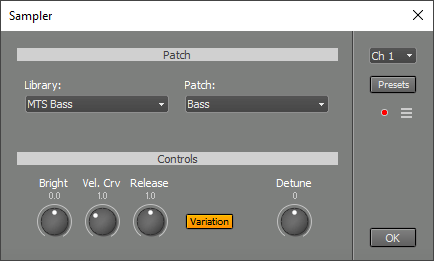 A Sampler will be loaded in the Instrument Slot and a patch will be created for it. The Sampler responds to messages on all MIDI channels, so the Channel value typically doesn't matter. It does matter if you're recording using the Keyboard Splitter or using multiple keyboards: it these situations you want only messages received on this channel will to be recognized. Note that sending pan events does not affect notes that are currently playing. If the MIDI file consists of multiple streams the Sampler uses only the first stream. The Sampler stores all samples in memory if enough memory is available. The amount of memory the Samplers are allowed to use can be specified in the Preferences window. Samples aren't stored in memory at all if there's not enough memory available. In this case they're streamed from disk directly. Should the data arrive too late silence will be played instead if the Sampler is used in record mode. You don't need to worry about this: the sound will be OK during playback. You can easily browse your sampler patches if you store them in separate folders (see left picture). The Patch Converter does this automatically. In the Studio-->Preferences window you can specify the folder containing all patches ('C:\Samples' in this example). If this folder is specified the Sampler's Load Patch button will start the Patch Selector (see right picture) instead of the file-browser. The Patch Selector's left pane shows all available categories, the right pane shows all available patches in the selected category. The Patch Selector's Browse button lets you browse for a patch file, including .SF2 and .GIG files. The Patch Converter will be invoked automatically if necessary. The Patch Converter converts third party sampler patches to MultitrackStudio .PTC format patches. Currently .SF2, .GIG and .SFZ files are supported. An audio file is generated for every single sample used in the sampler patch. Furthermore a .PTC file is generated for every instrument in the sampler patch. The new patch will be placed in the category that's highlighted in the Category box. New categories can be added using the New button. Typically, categories will be called Piano or Drums etc. Alternatively the Browse button can be used to specify a custom folder.